No matter what disability or level of functioning a child may have, art is one avenue where they may participate with non-disabled peers. It can be a challenge to design effective art experiences for children with physical or cognitive limitations. On the other hand, artistic expression can be one of the few avenues for success and should not be denied to these students. You can set everyone up for success! The answer lies in careful planning and choice of projects. It is important to recognize the characteristics of an inclusive art project. Projects that are easily modified and those that involve several forms of expression usually fit the bill. Generally speaking, a good inclusive art project allows a great deal of latitude for expression of personal style. It is the opposite of projects that require specific skills and have a “right" or “wrong" outcome. Inclusive projects don’t rely on technical skill for their beauty but rather on a process or presentation that enhances every student’s efforts. Stained Glass Art and Positive and Negative Pictures fit the criteria. Both of these projects have several different steps that impact the final outcome and a number of avenues for modification to suit individual needs. Materials needed include coloring book pictures, cardboard, plastic wrap, tape, foil and colored permanent markers. Put a picture on the cardboard, cover with plastic wrap, and tape securely. Color the picture on the plastic, then trace the outlines with a black permanent marker. Carefully remove the plastic and the original picture. Lightly crumple a piece of foil large enough to wrap around the cardboard, flatten it, cover the cardboard and tape in back. Cover the foil with the plastic wrap and secure in back with tape. 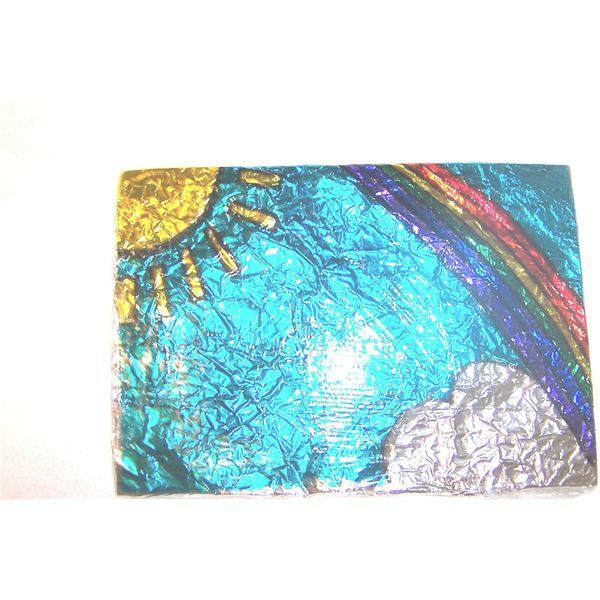 Light will catch on the foil folds to shine through the picture, creating a pleasing sparkle. This project is very inclusive because of the outlining step. It actually doesn’t matter how accurately or neatly the coloring is done. It doesn’t even matter what colors are used or how heavily the color is applied. The outlining preserves the sense of the picture and can be done by student, helper, or teacher. Whatever is added by the special needs student ends up looking sparkly and bright, and is always very pleasing to the eye. Materials needed include scissors, construction paper in contrasting colors, pencils, glue and optional stencils or patterns to trace. Use one large piece of construction paper and a piece that is half that size in a contrasting color. Fold the large piece of paper (color 1) into sections (1/8s work well for a 12 x 18 piece of paper) and cut the smaller piece (color 2) into sections that are the same size and shape as the folded areas on the big piece. You should end up with half as many pieces of color 2 as you have folded sections on the large paper. Trace a stencil or pattern if desired, or draw a freehand shape that can be cut from the middle of each piece of color 2. The shape should be simple and take up most of the space on each piece. Carefully cut the shapes out in one piece, like a puzzle. You should have the cutout pieces and the backgrounds in color 2. Finally, arrange the cutouts and the backgrounds in the sections of the large color 1 piece. Glue them in place. The final project will be a study in foregrounds and backgrounds. This project works well for special needs populations because there are several ways to adapt to each student’s needs. The shapes or stencils can be very large and simple without compromising the final product. Assistance can be provided with the drawing and cutting. Even students with limited mobility can choose colors, shapes, and arrangement of the different pieces on the large color 1 paper.